Premium WordPress theme Delicacy from LeThemes developers team is a super example how elegant a simple design may look and work for your business. 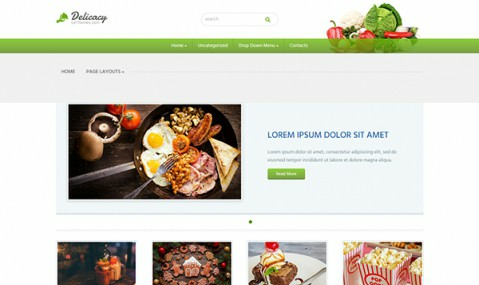 Clean white and green colors used for creation of this food WordPress theme is aimed to emphasize content on your website and cut down on annoying flashy effects which just distract visitors. Showroom, ready Contact page with feedback form, related pages and custom widgets with styles provided – all that is available for users of the full version of Delicacy in addition to standard functionality of lite version. Get it right away!